MASON, W.Va. — The Tornadoes are in front … and their new best friends up at Eastern may have just helped them stay there. 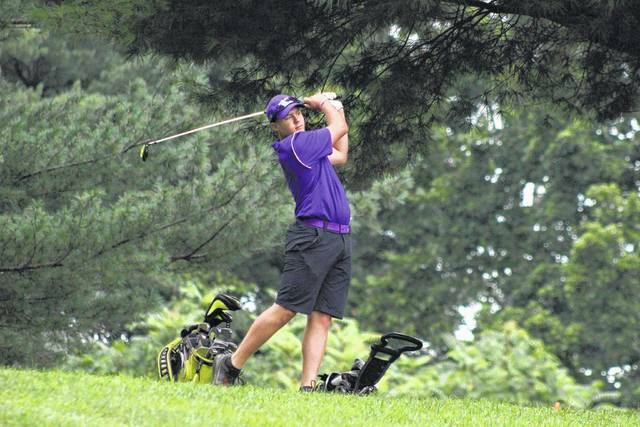 The Southern golf team took a two-game lead in the Tri-Valley Conference Hocking Division standings following a resounding 21-stroke victory over the field on Wednesday night at Riverside Golf Course in Mason County. The host Tornadoes — who entered the match tied with Waterford atop the season standings — posted the top three individual scores at the event while cruising to a winning tally of 168. The Eagles — Southern’s long-time arch rival — finished second overall with a team total of 189, while the Wildcats ended a disappointing day in third place with a 191. Wahama placed fourth with a 234, while Federal Hocking did not have a team score due to having only three players participate. With both Meigs County programs beating Waterford on Wednesday, it allowed SHS some extra breathing room with only three league matches left to play. Jarrett Hupp led Southern with a medalist round of 3-over par 38, while teammate Jonah Hoback was the individual runner-up with a 40. Jensen Anderson and Joey Weaver completed the winning tally with respective rounds of 41 and 49. Ryan Acree and Landen Hill also posted identical rounds of 50 for the victors. The Eagles were led by Jasiah Brewer with a 43, followed by Ryan Harbour with a 45 and Kylee Tolliver with a 50. Nick Durst completed the team total with a 51, while Kaleb Honaker and John Harris both had matching rounds of 55. Wesley Jenkins paced the Wildcats with a 46, followed by Travis Pottmeyer with a 47 and Bryce Hilverding with a 48. Grant Weihl completed the WHS scoring with a 50, while Evan Seevers and Matt Seaman also fired respective rounds of 52 and 57. Anthony Ortiz paced the White Falcons with a 54 and Jay Sayre was next with a 58. Gage Smith and Carl Sayre posted identical rounds of 61 to complete the scoring, while Dalton Kearns and Isaac Roush each shot a 63. Mitchell Clem earned the top score for the Lancers with a 63, while Shayne Fredericks and Jayden Lawson each posted rounds of 70. Southern’s Jensen Anderson tees off on the eighth hole at the Meigs County Golf Course in Pomeroy, Ohio, during a TVC Hocking match on Aug. 7.